As with all my Gooseberry Patch reviews, below you will find a list of the Chapters in this book as well as some of the soon-to-be tested recipes for my family and for you! Hope they sound good to you, too! Menus for all Occasions- over 40 menu ideas! For this review, I made Healthy Hummus, Easy Cheesy Enchiladas, Fried Okra Salad and Vickie's Gazpacho Dip. 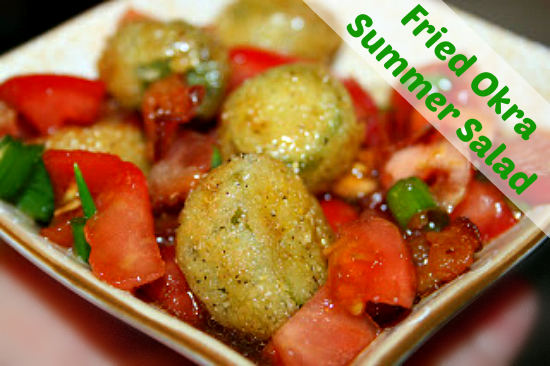 The Fried Okra Salad is below. Click each recipe to go to the other recipes. Fry okra as directed, drain. Combine okra, bacon, tomatoes, and green onions; set aside. Mix together remaining ingredients; pour dressing over okra mixture. Serve immediately. Serves 8. This has to be one of the tastiest salads that I made this summer. It was a huge hit with everyone in my family and I can't wait to make it again. It will always be on my recipe list of salads. I do not like to crumble bacon after it is cooked so I cut my bacon into pieces with kitchen scissors before frying. For the vinegar, I use balsamic vinegar which went perfect with the salad. No other changes were needed. You do need to eat this once you pour on the dressing. It is not as good the next day because the okra is no longer crispy. So plan on eating all of it! 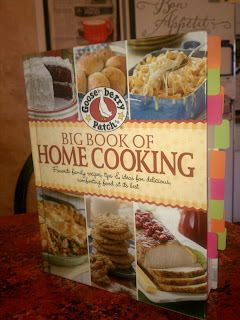 Thanks to Gooseberry Patch and Oxmoor House for providing the cookbook for my early book review. My own tasty opinions are expressed here! Our fav. home cooked meal is mexican!! This looks awesome, thanks. I haven't heard of these books. The recipes look delicious. Thanks for posting. My favorite home cooked meal is grilled steak, baked potatoe & salad. Wow, I'm not sure I could say for sure what is my VERY favorite. Two weeks ago, however, I 'accidentally' made THE BEST lasagna ever! I found a recipe somewhere for crockpot lasagna, and even though I didn't have ricotta, mozzarella or even cottage cheese, I was still able to somehow frankenstein enough stuff from the fridge to make the most wonderfully moist and flavorful lasagna with a delicious fluffy 'cheese' layer. It was incredible...and I fear I'll never be able to recreate it. GBP has a new tiny tips book collection. My favorite home cooked meal is roast baby potatoes carrots in a crockpot that has cooked all day and when you walk in the house the aromas surround you...yum! My favorite home cooked meal is my moms pigs in the blanket..love the combination of the cabbage and sauerkraut and tomatoes..yummy and great on top of mashed potatoes. I'm so excited for this new cookbook, I'm not sure how many Gooseberry Cookbooks I have in my collection but they are great. My favorite meal..hmmmm...probably a toss up between pot roast with veggies or lasagna..decisions, decisions..Hope I win the cookbook!! My favorite homecooked meal is probably pot roast over creamy mashed potatoes! 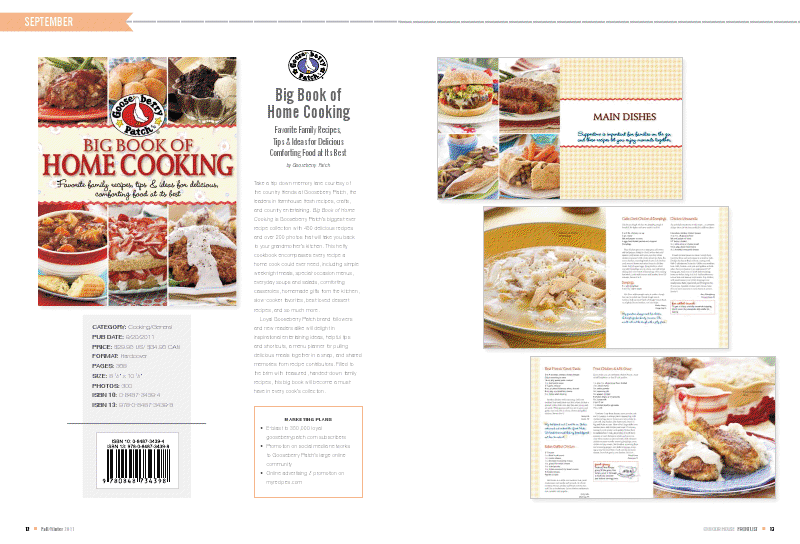 I am dying to get my hands on this cookbook! I jumped over to the GBP website and looked over all the delicious recipes in the recipe roundup. Have several bookmarked! YUM! 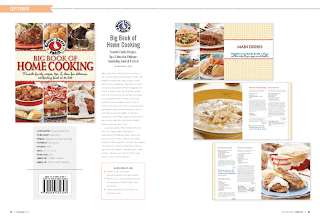 I cant wait to see this cookbook! Love gooseberry! What a fantastic book, would love to win it. My most favorite home cooked meal is chicken and dumplings. They are delicious and I could eat them every day. My favorite home cooked meal is my mom's meatloaf with mashed potatoes & gravy,green beans. YUMMY!!! I would love to share this with my son who loves to cook! I'm a follower, and I would love to win the GBP book!! :) Thank you!! Thanks for the giveaway! Favorite homecooked meal...that's hard. My mom always did a pork roast with mashed potatoes & black eyed peas when I was a kid that I loved! I love homemade chicken and dumplings. My fav home cooked meal is fried chicken, butter beans, creamed corn, and sliced tomatoes. My favorite home cooked meal is lasagnas and 5 cheese garlic bread! Fav home cooked meal would have to be mac n cheese from scratch baked w/ that crunchy crumb topping, homegrown tomatoes on the side and fresh caught lake perch! Gazpacho Dip Recipe looks like a great way to use my homegrown tomatoes, thanks! Easy Cheesy Enchiladas recipe sounds yummy...they are enchiladas as per my Chicano Hubby. Hummus recipe looks interesting, but I like tahini in mine. Left comment on your "Gooseberry Patch Big Book of Home Cooking Cookbook debut and giveaway info" post. My favorite homecooked meal is roast and potatoes. My favorite homecooked meal is French Onion Soup (topped w/ mozzarella cheese and croutons)and then Beef Tips with mushrooms, mashed potatoes and green beans! Pennsylvania Dutch Chicken Pot Pie. Everyone loves it and will come with smiles ready to eat. I work f/t and enjoy cooking/baking for my family!! 'Tis the season to be in my nice warm kitchen and enjoy the aroma of wonderful baked goods, casseroles, slow-cooker recipes ....and try new recipes!! Our family loves home-made Swedish Pancakes with 'berry syrup' and home-made Mac N Cheese - both are quick to make, fill you up with yummy deliciousness and are good on both hot and cold days. My favorite homemade meal is a chicken dish that was passed down to me without a name. It was my daughter's favorite (until she became vegetarian!) so I always called it "Kim's Chicken" and still do! I serve it with rice and usually green beans or broccoli! Love it! Hi! Just found your blog. I have about 25 Gooseberry Patch Cook Books. ! Love them. I would love to win the giveaway! Thanks for the chance. Love the cookbook . Would love to win it. Favorite meal...meatloaf and fried potatoes and onions. Any veggie as a side. Ok..now I'm hungry! Checked out the Vickie's Gazpacho Dip recipe...cant handle avocados....looks pretty though! At the Gooseberry Patch site, you can get a link to a free App for your phone. The hummus recipe looks SO easy!! This is my first time on your site. I like it!!! I'll be back. Thanks to all of you who entered. Stop back as I'll have more up and coming Gooseberry Patch giveaways, recipes, reviews and more. The winner was picked by rafflecopter and it is posted. Followed/visited up to Wendy L.